About 800,000 people die prematurely in Europe per year due to air pollution. The report also estimates about 800,000 people die prematurely in Europe per year due to air pollution, or roughly 17% of the 5 million deaths in Europe annually. Many of those deaths, between 40 and 80% of the total, are due to air pollution effects that have nothing to do with the respiratory system but rather are attributable to heart disease and strokes caused by air pollutants in the bloodstream, the researchers write. “Chronic exposure to enhanced levels of fine particle matter impairs vascular function, which can lead to myocardial infarction, arterial hypertension, stroke, and heart failure,” the researchers write. Their estimate more than doubles the World Health Organization’s previous estimate of early deaths due to air pollution. The researchers note that the air pollution, which is caused by burning fossil fuels, could be quickly alleviated by switching to clean and renewable energy sources. That switch would “substantially reduce the loss of life expectancy from air pollution,” they write. Previous reports estimated that air pollution takes one year off the average global lifespan, and that lowering it just enough to match levels recommended by the World Health Organization would be the equivalent of globally eradicating breast and lung cancer in terms of life spans. Air pollution has been spiking globally, rising 8% in just the last five years alone. India has the highest levels of small particulate-matter pollution (PM2.5) globally, according to the WHO, and is home to 16 of the 30 most-polluted cities in the world. A Lancet report from 2018 found that air pollution in India causes about 1.2 million early deaths a year. While India is the most-polluted nation, Europeans are exposed to more air pollution than the global average. But exposure isn’t distributed evenly across the continent. Previous research has demonstrated that Eastern European countries produce far more air pollution than those in Western Europe, due to more reliance on coal-fired power plants to generate electricity, higher use of wood and coal stoves for heating, and fewer pollution-mitigation policies overall. 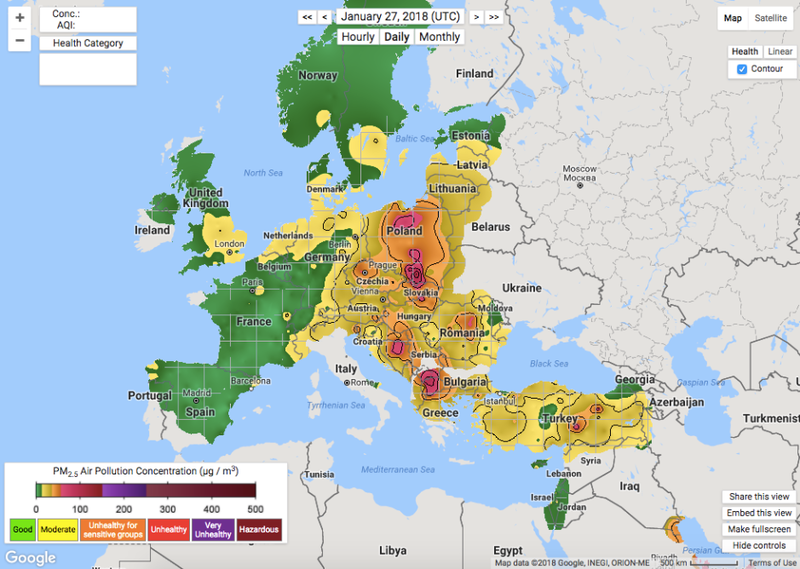 An iron curtain of dangerous air effectively divides Europe. A report published in October found that air pollution could save Europe up to $775 billion by 2025, by saving on health costs and the economic damage of premature deaths, but also by increasing tourism and real estate values in places currently devalued due to dirty air.